The Crimson’s class of 2014 survey (http://features.thecrimson.com/2014/senior-survey), which elicited 758 responses, revealed that lucrative finance and consulting jobs will employ 31 percent of working graduates, a statistic that has stayed steady in the past several years (after falling sharply between 2007 and 2009)—despite the recovery in other fields and restraints on the financial sector caused by changes in regulation and market conditions. White students were more than four times as likely to be legacies than students of color, according to their self-reported accounts. Seventeen percent of respondents said they had cheated while at Harvard, only 12 percent said an honor code would have changed their behavior, and 24 percent approved of the new code (see “Spring, Fevered”)—versus 64 percent who had too little information or no opinion. Recruited athletes were nearly three times as likely to be economics concentrators, and twice as likely to be government concentrators, than classmates—and twice as likely to admit to academic cheating. Twelve percent of women said they had been sexually assaulted as undergraduates—but only one-sixth of those reported the assault. 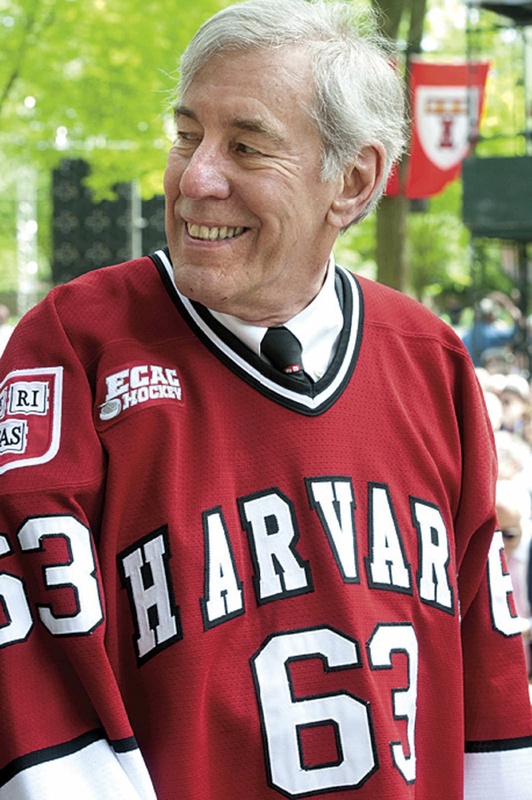 Withal, 92 percent of respondents would choose Harvard again. 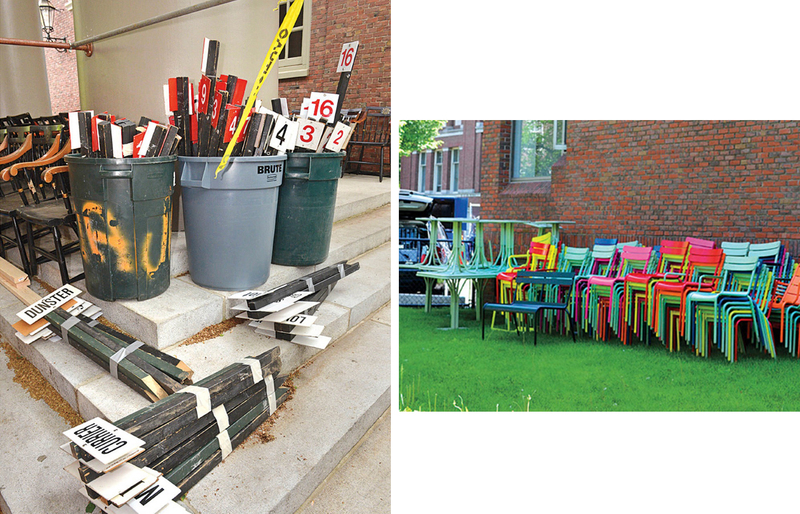 As battalions of workers deploy tens of thousands of folding chairs, plus tables and tents, for Commencement doings in Tercentenary Theatre and the Old Yard, other objects must give way. With 24 hours to go, the colorful “Common Spaces” chairs were stowed in the utility area behind Canaday, far from the celebratory throngs to come. Meanwhile, trash barrels behind the platform at Memorial Church held Morning Exercises signs awaiting their appointed places. Given the crowds and the scarcity of nearby hotel rooms, many families bunk far afield. On Commencement morning, begowned students and their parents could be seen queuing at some of the suburban MBTA stations, trying to apply their expensive book learning to figuring out how to buy subway passes, presumably for the first time, for the early commute underground into Harvard Square. 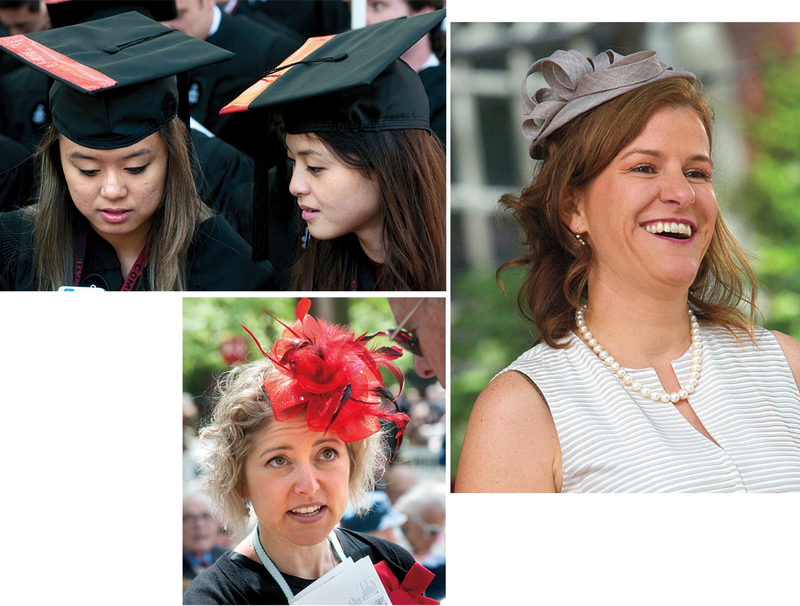 Harvard conferred a bumper crop of 7,301 degrees and 33 certificates: 1,662 from the College, 1,003 from the Graduate School of Arts and Sciences (including 590 Ph.D.s), 909 from the Business School, 750 from the Law School, 700 from the Extension School, 661 from the Education School, 566 from the Kennedy School…and on down to 112 from the Divinity School and 71 from the School of Dental Medicine. A banner hung over the Old Yard walkway by Thayer Hall welcomed the graduating seniors to the Harvard Alumni Association. Two graduates should have no trouble figuring out how to engage. Spencer W. Gisser ’14 is the son of Californians Cynthia A. Torres ’80, M.B.A. ’84, the HAA’s incoming president, and her husband, Michael V. Gisser ’77. From an ocean farther east, Samuel James Jerome Newmark ’14 is the son of Brooks Newmark ’80, M.B.A. ’84, a member the British House of Commons and the HAA’s first-vice-president-elect, and Lucy Keegan Newmark. Father Brooks is in line for the HAA presidency. The Newmarks’ eldest son, Benjamin, graduated from the College in 2010. Longtime Commencement volunteer Cynthia Rossano observed that the video screens early that morning broadcast the information that this was the 364th graduation exercises. The subtraction of one, by keystroke, set matters aright before too many mobile-phone photos were dispatched. Donald Pfister—Gray professor of systemic botany (an expert on fungi) and former master of Kirkland House—became a student favorite as interim dean of Harvard College this academic year. (The sentiment was reciprocated: he choked up while attempting to present the bachelors’ candidates for their degrees, paused, said, “I’m emotional,” was cheered, and then continued getting his charges graduated.) Although President Drew Faust’s afternoon remarks pointed up, depicting Tercentenary Theatre as a roofless space for learning, Pfister’s gaze was earthward: his last message to undergraduates, in the morning’s compendious Crimson, noted that inky-cap mushrooms, of the genus Coprinus, were growing in the Yard that day. President Abdullah Gül and First Lady Hayrünnisa Gül of Turkey shared the happy day with their younger son, Mehmet Emre Gül ’14. An image from Commencement appeared on the Presidency of the Republic of Turkey’s home page the next day. During the conferral of honorary degrees, when Provost Alan Garber said, “In 1945 he married his sweetheart, Barbara Pierce,” President George H. W. Bush gestured to Barbara Bush, in the audience.